Russia and Scotland are bonded by some fascinating characters and unusual relationships dating back centuries. Architecture is the most obvious domain where Russia often depended on European expertise, especially in the early days. From the start of the 15th century, Russian Tsars regularly invited foreign architects and engineers to assist with embellishing and fortifying the capital. The former helped to build churches, palaces, and particularly fortifications. Reconstruction of the Moscow Kremlin was one of the first major projects carried out by experts from abroad. Scottish architect and clockmaker Christopher Galloway was hired by the first Romanov Tsar, Mikhail, in 1624 to take part in construction of the best known Kremlin tower – the Spasskaya Tower, which overlooks Red Square. Galloway assembled the clock for the tower and installed the famous tented roof. As a chronicler of the time tells us, Galloway embellished the tier with four nudes of mythological characters, but the figures were later clothed in specially-made kaftans. The clock was unusual too: the dial-plate moved whereas the hand stood still. Galloway explained: “Russians are unlike other nations, so their clock should be different from the others”. Galloway came to Moscow in 1621 and it is unclear how he rose to prominence so quickly that he was hired by the Tsar just three years later. But we know that he was paid a considerable sum of 60 rubles a year for his services, which had risen to 75 rubles by 1640. 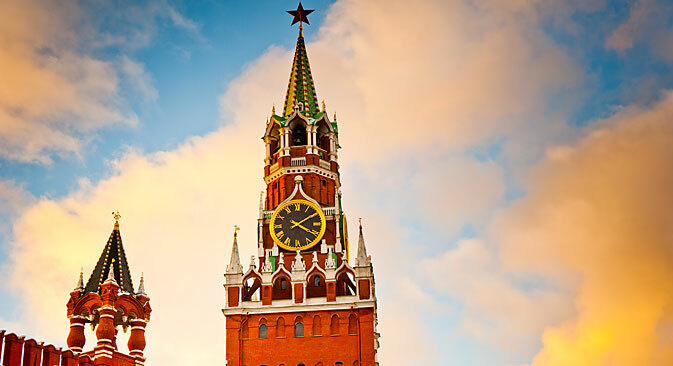 The Spasskaya Tower served as the main entrance to the Kremlin for the Tsars and remains so today. Moving to the 19th century, we encounter another building with Scottish roots not far from the Kremlin. The luxury department store known today as TsUM was called "Muir & Mirrielees" when it first opened in 1885, founded by two Scottish entrepreneurs, Andrew Muir and Archibald Mirrielees. They introduced the concept of the department store to Russia where you could buy anything from teddy bears to furniture, as well as some Western customer services like a money-back policy and delivery of goods to anywhere within the Russian Empire. The trading company was established in 1857 by Muir and Mirrielees, who then lived in St. Petersburg. The company moved to Moscow in the 1880s to open its flagship store, which expanded over the following decades until by 1914 it operated 43 departments and a restaurant, and employed more than 1,000 people. The present building on Theatre Square was erected in 1908 to the great anticipation and excitement of Muscovites, not least because "Muir & Mirrielees" was the first store in Moscow with elevators. The proprietors marked several stages of construction with Orthodox religious services and blessings of holy water. Though not Orthodox, they clearly tried to acculturate themselves and, in a clever marketing ploy, called their company a “Russian-English firm”. After the 1917 revolution, however, the store was nationalised by the Bolsheviks, who renamed "Muir & Mirrielees" first as "MosTorg" in 1922 and later as TsUM, the name we call it now. The history of Russian photography is incomplete without its Scottish names either. Scottish-born William Carrick (Василий Андреевич Каррик, 1827–1878) was one of the pioneers of the art of photography in Russia. He was born into a mercantile family in Edinburgh. Shortly after his birth, his parents moved to St Petersburg. At the age of 16, William enrolled at the St. Petersburg Academy of Arts to study Architecture, but soon turned his attention to photography. In 1859, together with his associate John MacGregor, Carrick started a photographic studio. At the time, photography was in great vogue and competition was high: Carrick found his niche first by reproducing fine arts, using a specially developed emulsion to capture paintings with great accuracy. Later he turned his attention to photographing ordinary people, and it is those photographs that gained him domestic and international acclaim. His Russian Types included images of street-sellers, tradesmen and other residents of the capital. Throughout his life and career, Carrick maintained connections with artists, particularly with the Wanderers group. In a truly Wanderer spirit, Carrick and MacGregor also traveled around Russia documenting people they encountered. Carrick’s images of peasants and rural scenes became a valuable source for studying ethnography, as well as evocative artworks in their own right. Russian-based Scots also succeeded immensely in the art of war. Michael Andreas Barclay de Tolly (1761-1818) was just one example, a Russian field marshal, a hero of the Great Patriotic War and anti-Napoleon campaigns in Europe. Known to Russians as Michael, Prince Bogdanovich, he was a descendant of a Scottish family which had settled in Russia in the 17th century. Barclay’s career in the army was exemplary: enlisting in the Pskov Carabineer Regimen in 1786, he became a colonel in 1798 and major-general in 1799. By 1810 he was made minister of war, and in 1812 he was given command of the biggest army operating against Napoleon. However, Barclay’s tactic of drawing the enemy deep into Russia was not welcomed by everyone and the appointment of a foreigner as commander-in-chief faced fierce opposition. After defeat at Smolensk, he had to resign his command and take a subordinate place under Kutuzov. The general was famous for his composure during battle: "Have a look at Barclay and the fear does not take," the soldiers used to say. Mikhail Bogdanovich participated in the famous Battle of Borodino and showed amazing bravery, in contrast to all the unjust accusations he faced. He personally led his troops in the attacks, and in one day alone four horses were killed under him. After Napoleon was driven from Russia, the eventual success of Barclay's tactics made him a hero. His popularity soared and his reputation was restored. In 1813, the Tsar re-appointed Barclay as commander-in-chief of the Russian forces. The last Scot in our little review might take you by surprise: one of the greatest Russian poets Mikhail Lermontov was of presumed Scottish descent. His alleged ancestor Captain George Learmonth was a Scottish mercenary who served in the Polish army. After Learmonth was captured, he switched sides and settled in Russia. George Learmonth’s 19th century descendant, Mikhail, was perhaps pre-destined to become a poet: going even further down the genealogical tree, we discover Thomas Learmonth, or Thomas the Rhymer, a semi-legendary hero who featured in Walter Scott’s collection of ballads Minstrelsy of the Scottish Border. Today the debate is still on over whether there are grounds to accept the connection between the Russian poet and the Scot. Yet Lermontov himself seemed to acknowledge his Scottish roots in a number of poems, like the one below, where he expresses his wish to visit the land of his ancestors. One could speculate that even Lermontov’s love of the Caucasus was an expression of longing for the native Highlands. Here Ossian's grave still stands.